My first attempt at predicting UK growth has turned out a little wrong rather than the 1% I called it was 0.5%. This is all a little embarrassing as I not only got the estimate wrong but also direction of growth, I predicted that it would be 0.3% stronger where it was in fact 0.2% weaker. 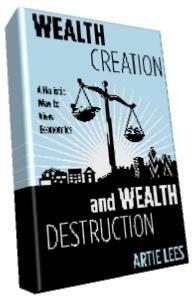 In mitigation I would argue that the large increase in money in the real economy threw me. On closer inspection this growth was primarily down to increased government spending rather than private sector activity however this should still have impacted on the GDP. The second mitigating point is that these are seasonally adjusted figures and the non-adjusted data may show a different picture when published. Clearly the approach of these predictions will need revising but that said here is the November forecast based on the original philosophy. I have also noticed that both the BOE and ONS continue to revise the previous month's figures leading to some discrepancy when comparing money growth between months. In the overall scheme of things these differences appear minor but will require further analysis. The money entering the real economy in September decreased by 0.94%, based on a rolling quarterly measure, and although a fall when comparted with the figures in of August they are in line with previous months. 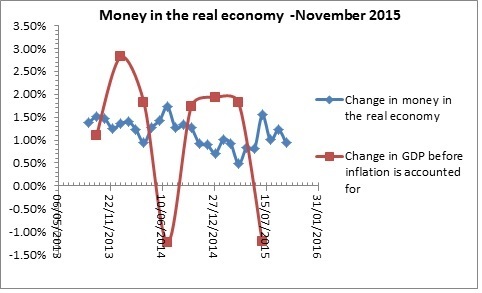 Based on the observed trend that changes to money entering the real economy are directly related to economic activity in the following 3 months, i.e. GDP before inflation is accounted for, we can say that GDP for the fourth quarter based on three months figures looks like it will be less than the 0.5% recorded for Q3. •	Interest created money increased by £6,332m in September an increase of 0.29% to the money supply and in line with previous monthly increases. •	And the net increase in government spending over revenue was £9,549m compared to £10,967m (£11,547m) for the previous month. This represents a net drop of 0.07% to the real economy although when the changes are averaged out over the last 12 months the level of government spending over revenue increases by 0.29%. Lending that on mortgages represented 68.16% and increase of 12 points on the previous month. This is up from 68.04% on the August and represents a continuation of the long term trend. The importance of this figure is explained here. Based on the proportion of interest created money from mortgage lending underlying inflation lies at 2.37% a year, a slight fall, but is not manifesting itself due to deflationary forces elsewhere in the economy, principally the fall in commodity prices and general constrictions on the money supply due to low interest rates. 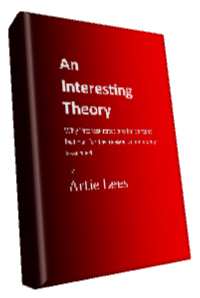 The purpose of this forecast is to provide a confident validation for the theory developed in 'An Interesting Idea'. No responsibility is taken for the accuracy of this forecast. Bank of England and ONS data sets have been used for this forecast. The information contained in this website is for general information purposes only.Any reliance you place on such information is therefore strictly at your own risk. In no event will we be liable for any loss or damage including without limitation, indirect or consequential loss or damage, or any loss or damage whatsoever arising from loss of data or profits arising out of, or in connection with, the use of this website.